The Greek government is increasingly unpopular. Opinion polls show consistent disapproval and discontent. Whether the government’s medium term plan succeeds depends on whether people will tolerate the hardships imposed on them. To answer that question it is necessary to ask another: who is protesting in Greece and why? Public Issue provides useful data on the protest movement in two recent reports. In May 2011, it offered a glimpse into the number of people who had protested over the last year, the number of times they had protested, their age, employment and affiliation. In July 2011, Public Issue also reported on the number of people that had protested over the past month, but with fewer details. Using these two reports, I have tried to offer a glimpse into the Greek protest movement. The May report is more useful because it provides details: 28% of respondents had protested at least once in the past 12 months. How can we quantify the protestors? According to the latest census, Greece’s population is 10.8 million people – because the census is so recent, there is insufficient date on the age distribution. Since Public Issue reports that its polls refer to people aged 18 and over, it would useful to restrict the analysis to that segment. The UN provides an age breakdown for Greece, showing that around 86% of Greece’s population is over 18 years old (9.3 million). Public Issue’s estimate is 9 million. The Greek Statistical Agency reports an-over 19 population of 8.8 million. Let’s use 9 million for simplicity. At a 28% participation rate, we’re looking at roughly 2.5 million protestors. The simplest way to classify them is to look at their employment status against the participate rate estimated by Public Issue. Public Sector employees. The Ministry of Finance, in its medium-term strategy document, reported roughly 700,000 people working for the government. At a 57% participation rate, that equals about 400,000 protestors. Private sector employees. In 2009, there were 2 million people who classified themselves as employees in tax returns. If we exclude the public sector employees above (700,000), we get 1.3 million people. At 49% participation rate, that comes to 650,000 people. Unemployed. Over the past year, there have been, on average, around 700,000 people who were unemployed - at 29% participation, we get roughly 200,000. Pensioners. Tax returns reported around 1.6 million people as pensioners. Given joint tax returns, that number likely understates the true number. The Greek Statistical Agency reported 2.1 million people over 65 years old. Since some pensioners retire early, that’s possibly an understatement; still, let us assume 2.1 million. At a participation rate of 14%, that's about 300,000 people. Self-employed. In tax returns again, there were 2 million people that could be classified as self-employed. At a 30% participation rate, that is 610,000 people. Housewives. According to the Greek Statistical Agency, there were about 1.1 million economically inactive women aged 25 to 64 (assuming that fewer women would be married before 25 and that over 64, they would fall in the pensioners category). This is obviously a rough estimate, but at 13% participation, there would be 150,000 housewives protesting. Adding these pieces together we get ~2.3 million protestors, just off the 2.5 million estimate above. Given the uncertainty in the data, the final figures are close enough. We can thus make some guesses on the composition of the protest class. 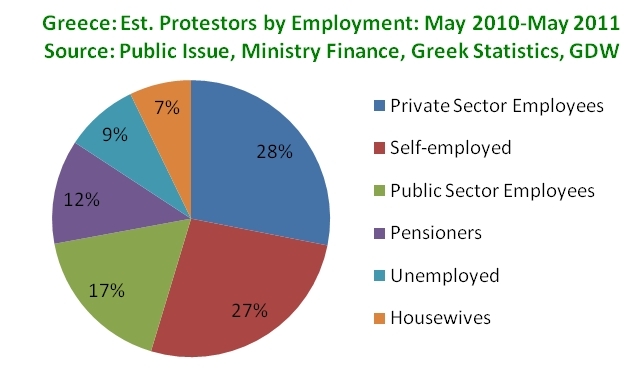 The private sector accounted for over half the protestors: private sector employees made up 28% of the total, followed by self-employed people (27%). The public sector, although it had the highest participation of all (57%), made up just 17%. Pensioners were 12%, the unemployed 9% and housewives 7%. As I have written before, Greece’s protest movement can be divided into three groups: those who oppose reform because they stand to lose from it; those who outright repudiate the political system; and those who feel reform is not moving fast enough. Given the numbers above, what can we say about the protest movement? Opposition to reform for self-interest. The first group includes people who see reforms as a threat to their privileges (see here and here). The group consists of public sector employees whose wages will be cut and whose ability to drain the treasury while offering mediocre services will be constrained. But this group extends into the private sector as well. No one should think of Greece as having an inflated public sector and a productive private sector: distortions in the private sector are just as pervasive. Opposition to opening up professions has been fierce, and strikes among truckers, taxi drivers, pharmacists, and others personify this. Pensioners fall into this category as well, although the legitimacy of their grievances is markedly different. If we add up public sector employees, the self-employed and pensioners, then we could allocate ~58% of the total protestors into this category. Opposition to the political system as a whole. The second group is harder to define but it consists of two subgroups. First, it includes the perennial protestors in Greek society. This group is more left than right and is probably unappeasable – its opposition runs deep and is as much ideological as practical. It protests in the name of anarchism or socialism, and its opposition is almost independent of who is in charge and what they are doing. Such opposition far predates the current crisis. These protestors are joined by a second sub-group, whose motives are vaguer. A deep sense of injustice from corruption is perhaps their most unifying rallying cry. Judging from opinion polls, however, this group has a peculiar view of how Greece got into its mess. Besides corrupt politicians, it blames speculators, banks and other European governments for Greece’s debt - much more so than Greek society, for example. By casting blame so widely, this group is almost casting blame nowhere at all. Its agenda is more destructive ("against" something) than constructive ("for" something). Before we allocate people here, let us look at the third group. Frustration that reforms are too slow. This group forms the most constructive force in Greek society – it is also the least represented in the “street.” It is liberal, meritocratic and opposed to clientelism. It is likely well educated, possibly with time spent abroad, and it may be younger rather than older. 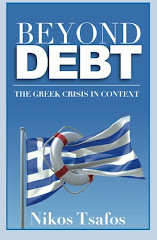 It sees Greek society as too constricting and the Greek economy as offering too few opportunities. It struggles with whether to stay in Greece or leave. It sees momentum for change but it also sees politics hijacked by special interests and narrow minded politicians. It wants change but change is not coming rapidly enough. We can say, roughly, that the balance of protestors (42%) are distributed between the two last groups, although my sense is that the distribution is heavily skewed to the people who are opposed to the system as a whole rather than to those who are upset that change is not happening rapidly enough. I say this chiefly on back of opinion polls on what Greeks complain about, which is rarely the slowness of reform. One more way to look at the issue is based on political affiliation. Public Issue reports two numbers that in combination give us a portrait of the protestors: the participation rate depending on one’s political affiliation and the voting intention of the respondents. Put the two together and you have a sense of the political leanings of the protestors. What is remarkable is that roughly 36% of the total protestors are drawn from those people who reached the point that they want to abstain – so a third of the protestors are in theory up for grabs if a compelling political program were in place. The next biggest group comes from New Democracy Party (center-right), followed by a 28% block of the far left voters (KKE and Syriza). 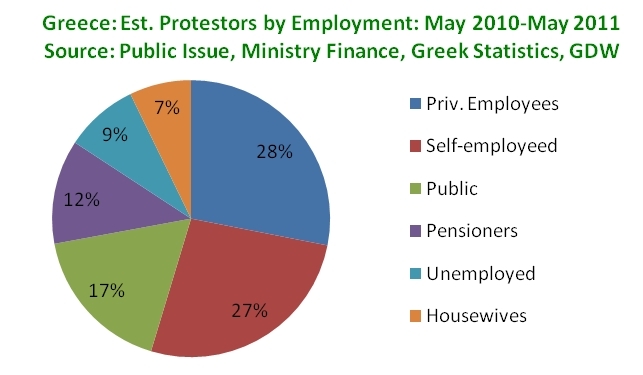 Voters of the ruling party PASOK actually formed less than 10% of the protesting class. This last number is puzzling: one of PASOK’s problems is that it is implementing policies against its core constituencies. So how to explain such little opposition? One answer could be that PASOK has lost so many voters that its protestors show up in other buckets (KKE, Syriza or ND) or, more likely, are just absenting. Another explanation could be that PASOK voters exercise leverage through other means (strikes, direct pressure) rather than protests. Finally, it could also be that PASOK’s constituents are more dispersed geographically and hence may have had less of a chance to protest directly. What to make of all these numbers? 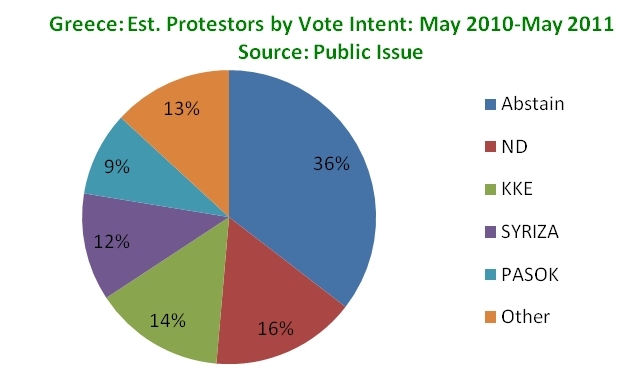 First, a majority (~58%) of the protestors is likely to have some self-interest in protesting. Against such forces, the government can only respond with a counter-veiling political force of its own. If it tries to appease these protestors, it may lose the support of its foreign supporters. This is not an option. Second, there is big force (~42%) that, possibly, has no “skin in the game,” meaning that its self interest could be served by either reform or a return to the status quo ante. This force consists of private sector employees, the unemployed and housewives – this may seem like an odd coalition, but it is a considerable force that could be used to counterbalance the self-interested protestors. Finally, there is also a 72% of the total public that did not protest. This is the silent majority that can still be swayed. Its composition straddles the political spectrum from center-left (PASOK) to center right (ND) and far right (LAOS) as well as the self-proclaimed abstainers. Who that 72% supports, in other words, will be key in the country’s future. Given a countrywide abstention rate of 38%, there is a large share of the population that is up for grabs. That is a long way to say that the political balance is held not by those in the streets but by those at home. And they have yet to pledge their allegiance. You get the economical facts more than right but the political ones not so much, probably because you are far away from Greece for quite long. The largest part of the protestors were not on the left side of the political spectrum, as it turned out most of them were, maybe potentially they still are, PASOK and ND voters. And if you ask me the biggest problem is that the parties or even individual politicians who really care about this country and its people can't come up with any realistic thoughts and ideas, let alone solutions while the more realistic ones care only about their own political and financial too interests, regardless if they like to call that a political agenda. It is this so extremely wide gap between theory and action, personal and public interest that has brought and the entire Greek political system, except of the economy, to default...and that is what makes matters so much worse. No argument on the quality of Greek politicians. But I think the data I show supports your points: if you assume that most people in the abstain bucket are disillusioned PASOK and ND voters (a fair assumption), then you indeed come up with a solid majority being supporters of the two big parties - which is consistent with your view. (Also, the analysis is based on May data so it doesnt reflect the latest protest wave).